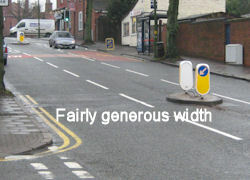 They are a sensible enough idea, which you can appreciate if you've ever tried crossing quite busy roads. Yes, a pedestrian crossing would help, but in a lot of cases it would delay traffic even more and that includes cyclists and motor vehicles. However, I've had two very near misses recently and I have to say its not really the fault of the motorists involved; even though its always tempting to blame them for being useless. Basically, its all too easy to get squashed or nudged if you go through the refuge gap at the same time as a vehicle. 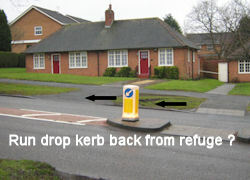 It seems that these refuges require an extra level of anticipation from both cyclists and motorists. The first incident I had was with a delivery van and yes, it was white. I heard it coming up behind, slow down, speed up and then accelerate to get through the gap between the reservation and the pavement. Meanwhile, I responded to the van when it slowed down behind me, by speeding up - which I was doing naturally anyway as the road had just started downhill. End result: the van and I arrived at the gap at the same time, resulting in me slowly falling towards the pavement and the van almost taking out the refuge. Bear in mind this was a seasoned cyclist and a delivery driver (I spoke to him !) who was in no particular hurry. Both quite skilled at using their vehicles. These refuges force both cyclists and motorists to anticipate speeds in each other and its not an easy skill. So what's the solution ? Surely these incidents will continue, particularly in narrow gaps, so isn't the best thing to at least help make them safer. One of the problems is that there's no escape for the cyclist, just a nice high kerb to send you crashing onto the pavement, or veering into traffic coming up behind. True there is a drop kerb for the pushchairs, but its only a metre wide or so. So couldn't the design be changed a little to extend the drop kerb a few metres back as well. That way, at least if you are about to get squashed, you can nip up onto the pavement and hopefully avoid having a nasty crash or worse ? Is that going to add a huge cost ? 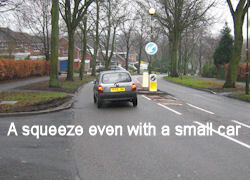 The answer is to take up a primary position as you approach the pinch point and close the door to overtaking traffic. This the technique taught for Bikeablity level 2, also see Cyclecraft (www.cyclecraft.co.uk) chapter 7 for full details. Cycling on the pavement really isn't the solution. The problem is that if you turn off onto the pavement you take yourself out of the drivers sight line and put yourself at greater risk when you rejoin the road. This is one of the most common causes of KSI among teenager cyclists. This is something which as a cycle instructor I strongly discourage, staying on the road and positioning yourself where drivers can see you is actually safer, although it does require a degree of confidence. What we really need is to have the pinch points removed and speed limits lowered, rather then using cyclist as human traffic calming.